The first of our 2 pump, 32Amp spas with comfortable bathing positions for 6 people and incorporates a lounger, this high specification spa is complimented with sound and lighting. The CS-6 is a powerful spa incorporating a variation of different design seating with different jet layouts, a contoured lounger and headrests. 47 jets give a great massage and the bather experience is further complimented with a Bluetooth™ sound system, perimeter LED lighting, water feature, ozone ad Heat Flow are fitted as standard. Warranty (terms apply) 5 Year Shell, 2 Year Equipment. If you don’t pay off the balance it would go into an interest bearing loan at 19.9% APR. Pay nothing for 3 months - 3 months payment holiday from the sale date in which you have to make no payments. If you repay the amount of credit at the end of 3 months there will be no interest or fees (early settlement fee of £29 if settled during payment holiday). If you don’t pay off the balance it would go into an interest bearing loan at 5.9% APR. Aqua Design and Leisure (ADL) is a trading name of Catalina Spas Ltd. Credit is subject to application and status. Catalina Spas Ltd. Downs Farm, Gomeldon, Salisbury, SP4 6JZ is a credit broke FCA Register no. 711748 for the purpose of introducing the credit provided by Hitachi Personal Finance, a trading style of Hitachi Capital (UK) PLC (Register no. 704348). Both are authorised and regulated by the Financial Conduct Authority. 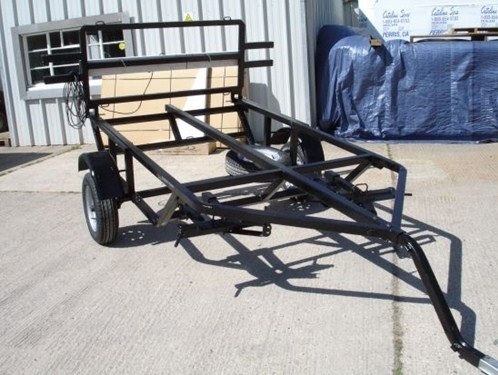 This purpose made trailer allows the spa to be delivered and manoeuvred into the garden flat, or on it's side to gain access through gates and walkways. If a Hi-ab or crane is required for your spa delivery, please contact Aqua Design & Leisure prior to ordering.